What happens at the sleep laboratory? Sleep and awakening quality are measured both subjectively (self-rating and observer-rating scales) and objectively (computer-assisted polysomnography and psychometric test batteries) and compared with normative data. The sleep laboratory (Fig. 1) consists of a patient room, a monitoring room for the night assistant and a bathroom. The patient checks in in the evening, makes himself/herself comfortable and meets the night assistant. About one hour before bedtime, preparations for the night recordings start. Measurements comprise electroencephalography (EEG), i.e. recordings of electrical brain activity, electrooculography (EOG), i.e. recordings of eye movements and electromyography (EMG), i.e. recordings of muscular activity. For this purpose, small gold electrodes are applied to the scalp, the outer canthi and the chin. In order to determine if the patient suffers from snoring or sleep-related breathing disorders, nasal and oral air flow are measured by means of a nasal canula and a thermistor applied between mouth and nose. Two belts strapped around chest and abdomen make it possible to record breathing movements. Snoring is recorded by means of a small microphone. 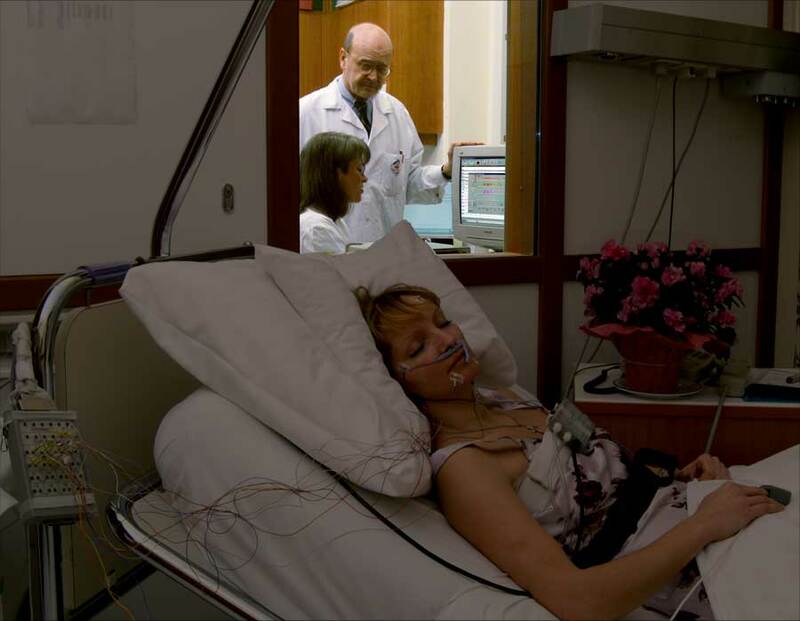 As oxygen saturation plays an important role in sleep-related breathing disorders, it is measured along with the pulse rate by a pulse oxymeter clipped on the patient’s finger. Leg movements that may disturb sleep are recorded by means of EMG electrodes applied to the lower legs. Cardiac activity is monitored by means of ECG recordings, which are able to detect cardiac arrhythmias. With adult patients lights in the bedroom are usually turned off at 22.30, when most people go to bed. This is the beginning of the sleep laboratory recordings, which last 7.5 hours and comprise 900 30-second epochs (Fig. 2). In the adjacent room the night assistant monitors the computer-assisted recordings. The patient is able to contact the night assistant at any time. Fig. 2. 30-second epoch of a polysomnographic recording with peripheral functions during and after an obstructive sleep apnea that lasted 11 seconds. In the 13 polysomnographic channels muscular tension (EMG), eye movements (EOG), bioelectrical brain function (EEG), heart rate (ECG), breathing (flow, sum, upper and lower effort), snoring (Trach), body position (BodyPos) and oxygen saturation (SPO2) are recorded. During the first 10 seconds an obstructive apnea (cessation of breathing) is clearly visible as a flatline in the flow channel. The next morning the patient is given a computer print-out of his sleep profile (Fig. 3) and a summary of the most important sleep variables. Fig. 3. 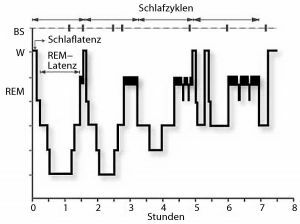 Normal sleep profile based on the classification (Rechtschaffen&Kales) of 900 30–second epochs. After a short sleep latency the patient reaches light sleep stage S1, spindle sleep stage S2, deep sleep stages S3 and S4, in which he remains for approx. half an hour before falling into a short period of REM sleep from which he may also awake. This is followed by three sleep cycles, with non-REM stages becoming shorter and less deep and REM stages becoming longer towards the end of the sleep period. (S)he is asked to report his/her subjective perception of sleep and awakening quality, well-being, drive, mood, affectivity and drowsiness. Objective awakening quality is assessed by a psychometric test battery on attention, concentration, attention variability, memory, reaction time, critical flicker frequency, muscular strength, pulse rate and blood pressure (Fig. 4). Later the nocturnal recordings of 900 30-second epochs/night are subjected to visual re-classification and subjective and objective sleep and awakening quality variables are compared with normative data. Usually sleep laboratory recordings comprise three nights: one adaptation, one baseline and one therapy night. 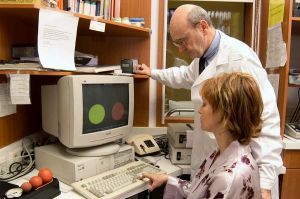 The adaptation night is intended to make the patient familiar with the sleep laboratory setting, the baseline night is for diagnostic purposes and the therapy night makes it possible to monitor the therapeutic efficiency of the proposed treatment.